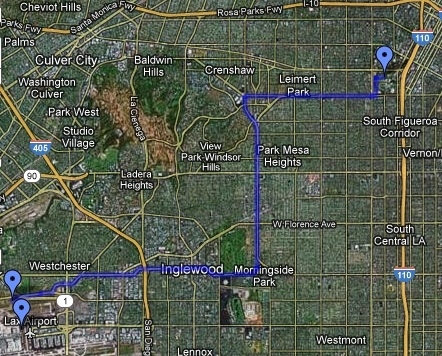 Endeavour’s route from Los Angeles Airport to the California Science Center (Credits: GoogleMaps). Since the ending of NASA’s Space Shuttle program in 2011, the remaining shuttles and their test models have been dispersing to final resting places in museums across the United States. In April, Discovery flew in to Virginia’s National Air and Space Museum aboard a modified Boeing 747. In June, replica Explorer made its way to NASA’s Johnson Space Center in Houston, Texas while flight model Enterprise battled wing-damaging winds on a barge to New York’s Intrepid Sea, Air & Space Museum. Now, the shuttle Endeavour is gearing up for its final trip to Los Angeles’ California Science Center. Much like Explorer, which made a long, slow trek through Houston streets with all the street lights removed to make room for its passage before being immediately replaced behind it, Endeavour is facing a challenging drive from the Los Angeles airport to its destination. The shuttle is approximately five stories tall, precluding it from passing under overpasses – thereby eliminating a highway route. The plan is to take Endeavour down a scenic route of residential streets. The only problem: many of those streets are tree-lined. The region is in the process of cutting down 400 trees to make room for the shuttle’s passage. While officials have embraced the opportunity to host Endeavour and are planning to plant twice as many saplings to make up for the downed trees, some residents are not at all happy with the plan. “It’s unacceptable to cut down oxygen-giving species just to let something pass by,” Johnnie Raines, a board member of the west area neighbourhood council, told the Guardian. “I would love to see the shuttle housed here but I don’t think we should lose trees that are 40, 60 years old.” The California Science Center reports that its foundation has donated more than $1.5 million for greening improvements in the affected areas and routes were chosen to correspond with areas that were already looking to remove trees of invasive species or incompatible with traffic and air quality plans. Endeavour is scheduled to parade through southern Los Angeles on October 12-13, its 24m wingspan sweeping through treeless streets on its final 19 km voyage.